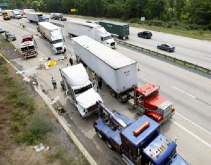 Tractor trailer accidents happen for many reasons and can be some of the most devastating accidents on Pittsburgh roads. Accidents involving commercial vehicles, whether the cause is obvious or not, usually result in an investigation on the company’s behalf. At the law firm of Martin and Lerda, our tractor trailer accident lawyers have the experience and dedication to handle whatever investigation your tractor trailer accident case requires. Contact us for a free consultation at 412-217-6800. Why is a tractor trailer accident any different from another automobile accident? Most trucking companies and their insurance companies have accident investigation teams that go out to the scene immediately, sometimes within minutes or hours of an accident. Their job is to locate and secure evidence that supports the truck driver’s version of how the accident happened. However, the truck driver’s story may differ in many respects from your recollection of the accident. To protect your rights, you need an investigator who will look for and document evidence that is favorable to your case. Never give an oral or written statement about your accident to a trucking company representative, its insurance company or its lawyer until after you get advice from a tractor trailer accident lawyer yourself. Ordinarily, you should not discuss how your accident happened with anyone representing the interests of a trucking company or its driver. Why? Among other things, you may be asked leading questions that are designed to confuse you and elicit answers that can be twisted around unfairly to make it look like the accident was at least partially your fault. An expert mechanic to review vehicle maintenance records. A trucking industry expert to review a truck driver’s personnel file to determine if the truck driver or his employer failed to comply with federal motor carrier safety regulations. A mechanical or safety engineer may examine the truck or tractor trailer involved in your accident to determine whether a mechanical failure is responsible for the accident. An accident reconstructionist may work out how and why your accident happened. Our tractor trailer accident attorneys are dedicated to recovering the just compensation you deserve and will take whatever steps are necessary to make that happen. Contact us today for your free initial consultation regarding your tractor trailer accident and begin the healing process immediately.